Editor’s note: Brian Lynn was the patient honoree at the 2017 A Night for Heroes gala, an annual event that benefits UF Health TraumaOne, the region’s only adult and pediatric Level I trauma center. Brian Lynn doesn’t remember the helicopter ride to UF Health Jacksonville on April 24, 2016. He has no memory of the trauma surgeons or nurses who rushed to stabilize him after he arrived. He can’t recall having his brain scanned or being prepped for the emergency surgeries that would ultimately save his life. The 43-year-old father spent 17 days in the Neuro Intensive Care Unit, but can only remember the last six. Brian relies on his family to fill in the blanks. Although he can’t account for a single second of his blackout, he believes the lifesaving care he received immediately following his traumatic brain injury is the only reason he is alive today. “It is not lost on me that had it not been for UF Health Jacksonville, I wouldn’t be here right now,” Brian said. 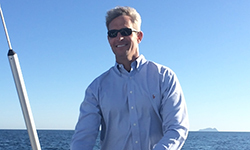 Brian is a business owner and former Marine who lives in Ponte Vedra Beach, Florida. 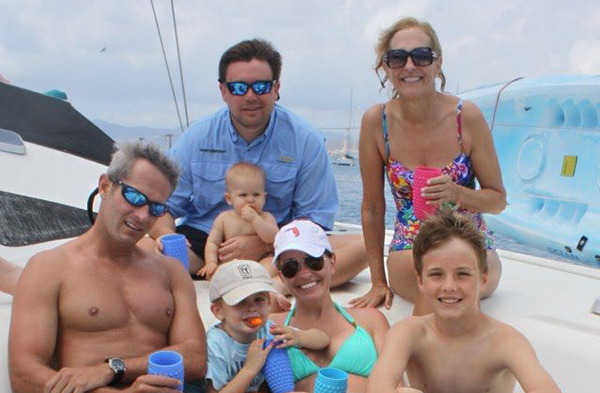 When not in the office, he spends the majority of his time with his wife, Leslie, and three sons, Reese, Christian and Jack. His last memory before the blackout was exhaustedly getting up after spending a full day with them in St. Augustine. Two weeks later, he woke up in a hospital room. “I remember telling my wife I felt nauseous before heading to the bathroom,” Brian said. Seconds after he got up, Leslie heard a crash. She found Brian on the floor bleeding from his left ear. She called 911, and paramedics placed him into an ambulance. It wasn’t long before they realized he had to be quickly transported to the UF Health Jacksonville Trauma Center. “They said he was declining and wasn’t responding to any more questions. He wasn’t in the state he was initially,” Leslie said. Brian was flown to UF Health Jacksonville, where he received treatment within an hour of Leslie’s initial 911 call. Scans showed Brian had an epidural hematoma — bleeding between the brain and skull that required immediate surgery. He also had fractures in his face and on the left side of his temporal lobe, causing spinal fluid to leak out of his ear. Hours after the surgery, Brian’s condition didn’t improve. The bleeding didn’t stop, and surgeons went in a second time to save his life. The second procedure took hours, but this time Brian stabilized. He was placed into a medically induced coma that lasted for almost two weeks. His family never left his side. “It seemed like a lifetime. It was just day after day. Brian was struggling, and he would just shake,” said Mike Lynn, Brian’s father. “He wasn’t breathing on his own. He had drains coming out of his head, bandages around his head and a scar on his head. He was virtually unrecognizable,” Kate said. During the wait, Brian’s sister started a blog on CaringBridge.com to help keep friends updated on his condition. Thousands read the posts, with people from as far away as Mexico praying for his recovery. “I was updating it daily to tell people about what he was going through and what the prognosis was, but also chronicling it, hoping one day Brian would be able to read it,” Kate said. Brian’s father spent his mornings at the hospital, only leaving to get coffee. On May 5, he returned from his coffee run to a miracle. After 11 long days in a coma, Brian was finally awake. Physicians and nurses continued to monitor Brian’s condition. They spent the next five days working to get him strong enough to proceed to the next phase of his treatment. “It wasn’t over yet, but each day you could see him getting stronger,” Penny said. “That was just miraculous. It really was." Brian was released from UF Health Jacksonville on May 10. He continued his treatment at Brooks Rehabilitation, where therapists spent hours working with him every day to improve his physical and cognitive skills. It has been months since Brian returned home. He went back to running his business full time in November, and he is slowly working to regain his peak physical condition. Brian can no longer smell or taste his food. He also lost most of his hearing in his left ear, but he is alive. “There are no words to describe how thankful I am that my husband is still here,” Leslie said. During his time at UF Health Jacksonville, Brian was treated by the trauma team, trauma psychology, neurosurgery, neuro critical care, oral and maxillofacial surgery, vascular surgery, vascular neurology, audiology, pharmacy and many other departments. “You are not going to find more skilled doctors or nurses who can successfully handle an injury of this magnitude. He was with the best,” Kate said. 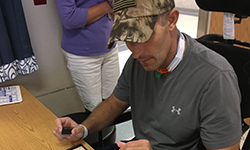 The most critical moments of Brian’s recovery are the ones he can’t remember, but he doesn’t need those memories to know he owes his life to the men and women at UF Health Jacksonville. “I owe my recovery, I owe my existence to UF Health,” Brian said. 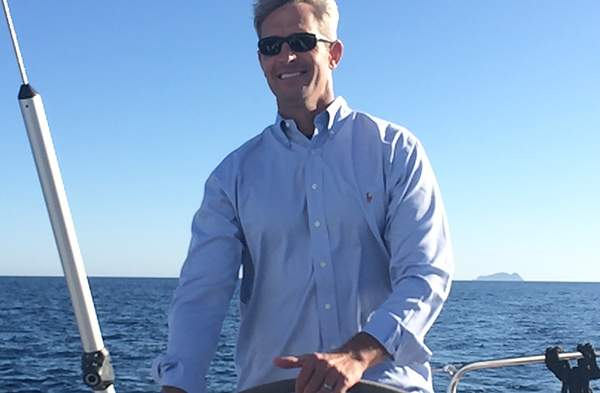 One of Brian Lynn’s favorite hobbies is sailing. 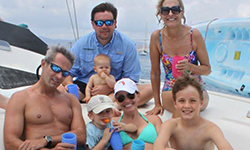 He is extremely grateful he can continue to sail because of the physicians and nurses who saved his life. 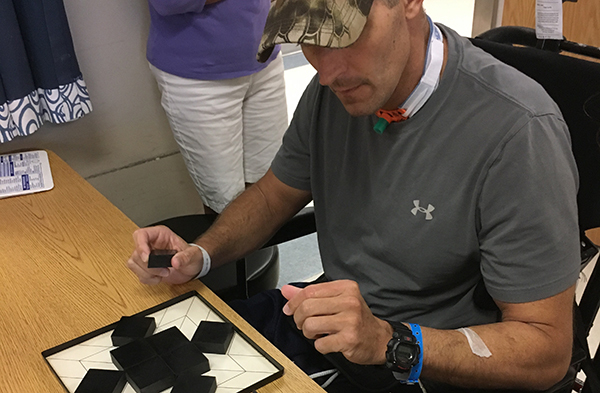 Brian Lynn spent several days working with rehabilitation therapists who helped him improve is physical and cognitive skills after the traumatic brain injury. Brian Lynn is surrounded by his family. They enjoy every moment spent together after the accident because they came so close to losing Brian.